Ms. Ruffing has been a member of the Arthritis Center since 2000, currently serving as the Director of Nursing and Patient Education. She is a critical member of our patient care team. She has been involved in numerous clinical trials for biological and nonbiological therapies in arthritis. Ms. Ruffing’s position in the Johns Hopkins Arthritis Center has allowed her to develop numerous educational initiatives for patients, staff, faculty and fellows. These initiatives include: written and video development of unbranded medical education for all patients with rheumatic diseases, fellows lectures on educating patients and how to discuss medications and their risks and benefits. She has developed written protocols for biologic use. She has been a course director for the annual Division of Rheumatology CME course for 2010 and 2011. 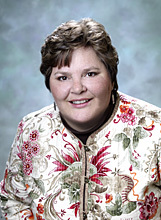 Ms. Ruffing was a founding member of the Rheumatology Nurses Society, incorporated in 2007 as a resource for the growing number of registered nurses entering the field of rheumatology. Under her leadership as president from May 2008 through August 2010, the society grew to 400 members. She has been successful in promoting Rheumatology Nursing as a new field of nursing and is working toward development of a certification process for nurses in this discipline, developing curriculum and training standards. She has developed and directed three conferences for the RNS.